The collect and readings for the Ninth Sunday after Pentecost, Proper 14A, may be found here. The appointed gospel is Matthew 14:22-33. It is not hard to imagine what it was like for the disciples that night as they crossed the Sea of Galilee. We need only think about the storms that have blown through our own lives. Think of a time when your life was drenched in darkness, that three or four in the morning kind of darkness. It’s so dark you cannot even see your own hand. You do not know what is ahead or when you will arrive at the new shore. Think of a time when it felt as if you were drowning in fear. You began to see ghosts. Something was there. Something was going to get you. Ghosts may not be real but fear is. Recall those days when the winds of change were blowing against you and no matter what you did, how hard you rowed, you got no where. Maybe there was a time when the events of life battered you over and over like ocean waves. Storms come in all sorts of different ways striking individuals, families, churches, nations, and the world. Cancer, divorce, schism, famine, war. We can all tell stories about how life was blown off course, the structures of life were washed away, plans and hopes damaged or destroyed. Whenever the storms of life arise so does the question of faith. Do we have faith? Do we have the right kind of faith? Do we have enough faith? Jesus’ question to Peter is one that often haunts us as we cross the sea of life. “You of little faith; why did you doubt?” There’s something about that question that makes quick, trite answers and assumptions much too easy. “You just need faith. If you had more faith you would get what you prayed for. A different kind of faith and your life would be better, easy. If your faith was stronger you wouldn’t doubt, struggle, or question.” So I wonder what would have happened if Peter had more faith, enough faith, a different kind of faith. The usual answer is that Peter’s fear would have disappeared, the wind and waves would have been of no consequence. He would have continued walking on water. There is a real danger in this kind of theology and understanding of faith. It says that if we have enough faith we will overcome the storms of life in some spectacular way. Somehow we will transcend the laws of nature, physics, biology. We will defy gravity. In extreme cases some will forego medical care for faith. That is not the kind of faith to which we are called. That is not what faith is about. That is more about magic than faith. It seeks proof or evidence to support belief. That kind of faith will not carry us though the storms of life. We will eventually sink like a rock in water. That’s what happened to Peter. Perhaps it is no coincidence that his name in Greek means stone or rock. Regardless of how much faith we have disease takes a toll on our body, accidents happen, loved ones die. Despite our faith life is difficult, relationships break up, we don’t always get what we want. No matter how strong our faith the sea of life gets rough and stormy. Maybe the usual answer is simply wrong. Maybe faith is not about walking on water through the storms of life but about staying in the boat. With a different kind of faith Peter would have stayed in the boat. “You of little faith; why did you doubt?” Maybe Jesus is asking why Peter got out of the boat. It was Peter’s idea to get out of the boat. Peter is the one who wanted to defy gravity, the one who sought some spectacular proof of Jesus’ identity, presence, and power. “Lord, if it is you, command me to come to you on the water.” Peter’s words are reminiscent of an earlier time and place. Satan. The wilderness. “If you are the Son of God….” Peter’s faith has taken him out of the boat and put God to the test. I don’t say this in judgment or criticism of Peter. I say this as one who recognizes himself in Peter, as one who wants to walk on water and escape the storms of my own life. I say this as one who has seen and heard others express that same desire. At some level we have probably all lived with Peter’s faith. To the extent we have we need to go on ahead to a different kind of faith. The disciples’ voyage across the sea is a passage from one kind of faith to another. It is the journey from faith used to escape life’s storms to a faith that carries us through them; from an external faith of physical presence and proof to an interior faith of spiritual presence; from a faith dependent on the circumstance of our life to one that experiences Christ present regardless of what is going on around us. Jesus physically separated himself from the disciples and sent them on ahead but he never left them. Their faith and our faith must now be experienced as larger than Jesus’ physical presence; not limited by the boundaries of what can be seen, heard, touched, or understood; independent of miracles that overcome the laws of nature. Jesus is taking us from a get-out-of-the-boat kind of faith to a stay-in-the-boat kind of faith. This transition of faith happens in the dark night of our life, in the midst of life’s storms. In every storm of life we must decide whether to get out or stay in. Faith is not a way to escape the winds and waves of life. It is the way through the storms of life. Sometimes faithfulness means staying in the boat and simply rowing. A stay-in-the-boat-faith knows that Christ is always coming to us. We are never abandoned. There is no storm we go through in which Christ is not with us. A stay-in-the-boat-faith never gives up because Christ never gives up on us. 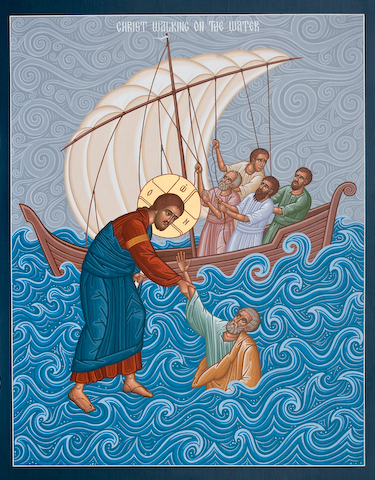 With every storm through which we sail Jesus comes to us saying “Take heart, it is I; do not be afraid.” He gets in the boat with us and the winds cease. Our walking on water is not the miracle. The miracle is that Christ is stronger than any storm that comes our way. The miracle is that with Christ in the boat we pass through the storms of life to a new shore and a new life. Maybe the stay-in-the-boat-faith is the seeking solace. To be like Peter is very scary and in need of strength. Do I wait in the boat or risk walking on the water of life toward Jesus? This is a daily and moment by moment question.